Sushma Swaraj said "both humanity and compassion were missing during the meeting that was arranged on humanitarian and compassionate grounds." 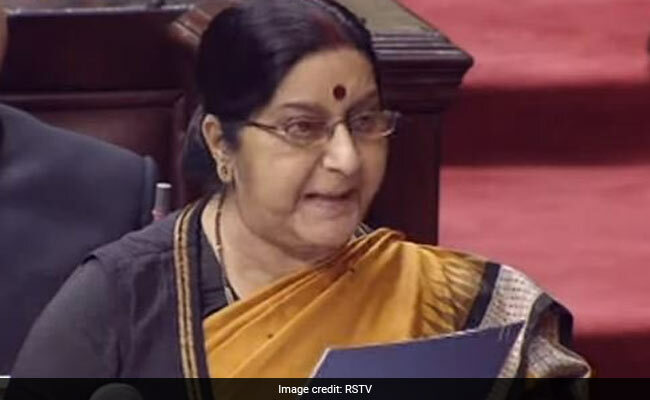 New Delhi: Two days after his mother and wife met Kulbhushan Yadav, who is facing a death sentence in Pakistan, Foreign Minister Sushma Swaraj hit out at Pakistan in the parliament today saying that the country "used the emotional moment between a mother and her son, and a wife and her husband after a period of 22 months, to further its propaganda." I rise to apprise the House of recent developments pertaining to Shri Kulbhushan Jadhav, an Indian national in the illegal custody of Pakistan. As the House is aware, his mother and wife met him on 25 December 2017 in Islamabad. The meeting was arranged through diplomatic channels. 2. In April 2017, I had made a statement in this House underlining the Government's determination to do everything possible to ensure Shri Jadhav's well-being and secure his release from illegal detention. Since then, the House is aware that we approached the International Court of Justice and obtained provisional measures that stayed the execution of the death sentence that was passed on Shri Jadhav through a farcical Pakistani military court process. While the imminent threat to Shri Jadhav's safety was averted as a result, we are now engaged in seeking a permanent relief, based on stronger arguments, through the legal avenue offered by the International Court of Justice. 3. I had also conveyed that we were in constant touch with the family at this difficult time. It was, therefore, natural that we took up the cause of family members who sought access to Shri Jadhav with a view to ascertaining his well-being for themselves. These efforts were pursued persistently through diplomatic channels. As a result, this month, the Pakistani authorities consented to a meeting between Shri Jadhav and his mother and wife. (vi) The shoes of the wife of Shri Jadhav were removed before the meeting and she was given slippers to wear to the meeting. The shoes were not returned to her despite her repeated requests after the meeting. The Pakistan authorities have been cautioned against any mischievous intent in this regard through a Note Verbale yesterday. 5. The mother and wife, after their return, conveyed to me that Shri Kulbhushan Jadhav appeared under considerable stress and was speaking in an atmosphere of coercion. As the meeting evolved, it was clear to them that his remarks were tutored by his captors and designed to perpetuate the false narrative of his alleged activities. His appearance also raised questions of his health and well being. 6. The meeting of Mr. Kulbhushan Jadhav with his mother and wife was portrayed by Pakistan as a humanitarian gesture. However, the truth is that both humanity and compassion were missing during the meeting that was arranged on humanitarian and compassionate grounds. There was a serious and gross violation of human rights of the family members of Shri Jadhav and an intimidating atmosphere was created for them during this meeting. There are not enough words to condemn the same. 7. I am fully confident that this entire House and through this House, the people of India, strongly condemns, in one voice, the obnoxious behaviour of Pakistan and affirm their solidarity with the Jadhav family.